Prosthetics and orthotics journal brings articles in all areas related to medical and clinical experimental studies of new devices, biomechanics, orthotic and prosthetic prescription, design and fabrication techniques including patient management experiences on Quarterly basis. The journal welcomes the submission of manuscripts that meet the general criteria of significance and scientific excellence. Papers will be published approximately 10 days after acceptance. As a member of iMedPub Group Prosthetics and Orthotics journal follows the Creative Commons Attribution License and Scholars Open Access publishing policies. Prosthetics and orthotics journal follows a progressive editorial policy that encourages researchers to submit the original research, reviews and editorial observations as articles, well supported by tables and graphic representation. 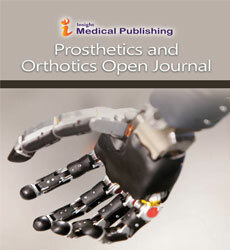 Prosthetics and orthotics journal is self-financed and does not receive funding from any institution/government. Hence, the Journal operates solely through processing charges we receive from the authors and some academic/corporate sponsors. The handling fee is required to meet its maintenance. Being an Open Access Journal, Prosthetics and orthotics journal does not collect subscription charges from readers that enjoy free online access to the articles. Authors are hence required to pay a fair handling fee for processing their articles. However, there are no submission charges. Authors are required to make payment only after their manuscript has been accepted for publication. Confirm that each individual named as an author meets the uniform requirements of the Prosthetics and orthotics journal criteria for authorship. 1. Brusic V, Rudy G, Honeyman G, Hammer J, Harrison, L. Prediction of MHC class II- binding peptides using an evolutionary algorithm and artificial neural network. Bioinformatics 1998; 14: 121-130. 1.Baggot, JD. Principles of drug disposition in domestic animals: The basis of Veterinary Clinical Pharmacology. (1stedn), W.B. Saunders Company, Philadelphia, London, Toranto 1999. 1. Hofmann T The Cluster-Abstraction Model: unsupervised learning of topic hierarchies from text data. Proceedings of the International Joint Conference on Artificial Intelligence 1999. From time to time, an author may wish to withdraw a manuscript after submitting it. Changing one’s mind is an author’s prerogative. And an author is free to withdraw an article at no charge – as long as it is withdrawn within 10 days of its initial submission.If you have concerns or questions about it, please contact us for further discussion. We welcome your input.